The Great Climb – climbing live on the BBC! 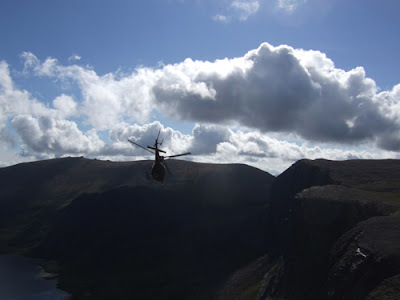 Ring of Steall project sent! Yesterday was the scariest day of my life, and the end of the scariest ten days of my life. 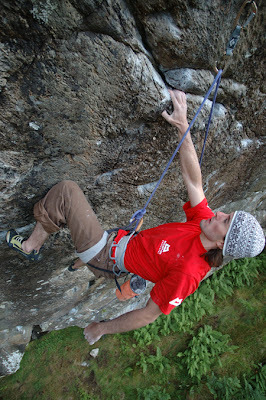 The impending lead of my ‘Great Climb’ project on Hell’s Lum crag was hanging over me like a guillotine. It’s the most dangerous lead I’ve ever done, and right now, I’m not sure exactly how I feel about it. Falling off from the crux or above would have meant death. 80 feet to the gully bed. In the moment of the lead, I screamed at myself twice at the top of my voice because the reality hit me of where I was and what I was doing. I think it achieved little more than spreading my fear across everyone who was there filming, Tony who was on the skyhook rope and especially Claire on the gully sprint rope running through the only good gear, 40 feet below me. An outcome was needed to free everyone from the sentence, so I screamed away all my thoughts and uncaringly hydraulicked like a robot through the slopers and on to the belay. When I got there I just felt guilty for engaging with this undertaking in the first place. On a personal level it’s OK – I’m up for this type of experience, full on as it is. But it’s not fair on everyone else for me to be walking around for ten days consumed in my own ugly world of fear, and blind to other people’s needs. I’m massively in their debt, especially Claire’s. Being with Cubby last week was very helpful – having a history of this type of situation, he knew the score, and was great counsel. This route overstepped the red line for me, but not in terms of personal danger, just in terms of the cost of dealing with the danger. I want to be a climber pushing my limits. But I don’t want to be a climber pushing everyone else’s limits as well, even temporarily. I’ve learned, and my next challenge is to climb something like this or harder, without my personal hell spilling beyond my own head. Anyway, now it’s over, I’m happy that I could do something positive for the guys behind The Great Climb programme. By the sounds of it the footage will be used soon by the BBC. Everyone is still recovering from the day, it was a long one! A very tired Claire and me (with 4 ropes and 2 racks on my back) left Hells Lum last and eventually found the top of Coire an t’ Sneachdha in the dark and rain and picked our way carefully down the Coire and back to the ski car park after midnight. 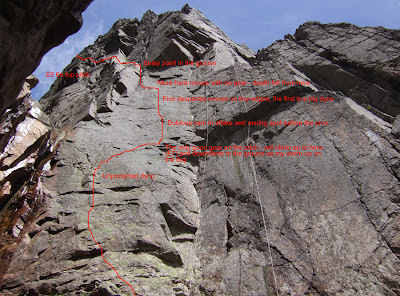 Claire took the pictures of pitch 2, a superb forty five metre pitch of E5. Description for the route at the bottom too. The route climbs the big smooth vertical wall right of the waterfall in Hell’s Lum, crossing Chariots of Fire higher up to finish up the smooth overhanging headwall. A fall from anywhere on the second half of pitch one is unlikely to be survivable. 1. 35m Start just left of the open groove. Move up the wall on positive holds to a dyno. Follow a sloping rail rightwards to a stopping place (good cams). 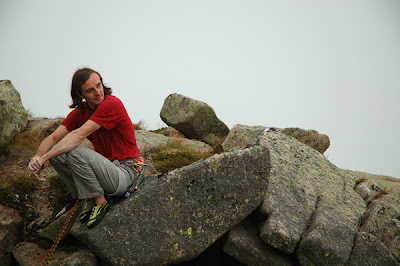 Climb the wall on crimps to a fragile and hollow flake (dubious skyhook and cam). Dyno left to a quartz edge, then crimp desperately to a good edge. 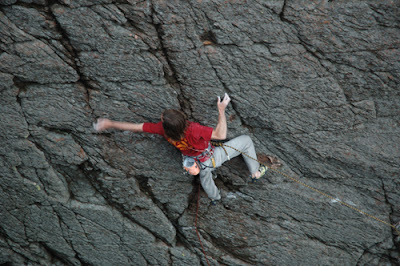 Move up, then left along slopers to a flat and often wet hold in the hanging groove. Climb the groove (poor RP2 on right) then move left around the arête and up to easy ground in the groove, leading to the belay on Chariots of Fire. 2. 45m Follow Chariots of Fire through it’s crux then break left across an overhanging wall on flakes, to eventually gain a groove with some detached blocks. Climb it to a small ledge. 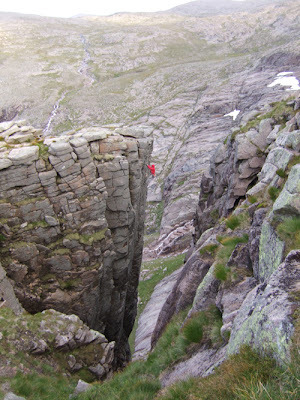 Step left and climb the faint crack in the headwall past a thin move to an exhilarating finish. We can all readily appreciate the beauty of rock and the shapes it gives to the world, we just have to travel through the landscape. If we want to dig deeper, we can travel over mountains and look at them. A visual interaction with the rock. Rock climbing is a deeper interaction with the rock. The medium of movement on rock allows us to crack open the beauty of rock not fully visible to the eye and get more back. The harder the rock climb, the more we have to understand the rock to move, the more we learn. The more dangerous the rock climb, the more we have to understand the rock so we can stay alive. The hardest and most dangerous climbs are the most meaningful, but they come at a cost most rock climbers wouldn’t dare to pay. Every climber finds their own balance of cost and reward. There were a lot of very upset people camped underneath Cairngorm this morning. Over sixty people worked their asses off all week to make something amazing, but the Scottish rain had the last word as always. Richard Else held up his hands and exclaimed “it’s the one thing we could never control!” Of course. We could only hope for a bit of luck. Although I’m like everyone else involved – gutted – it was still worth taking the great chance. Only the people involved will ever know it, but if the sun had only shone, the show would have been something folk would have talked about for a long time. All sixty would have their own story to tell about trying to make the live BBC climb happen, all proved themselves experts and it was a pleasure to watch them in action. My own part was to climb a very hard new route on Hell’s Lum. On Friday the sun shone and I worked on the route and felt very confident I could pull it off. I would have led it on Friday and it was hard to walk away knowing the forecast was bad. But, if it had turned out different, it would have been worth it. The route I prepared has some of the most perfect rock and moves I’ve experienced. You wouldn’t believe the lengths everyone had to go to to get everything in place for the programme, bt by Friday night it was all there and there was a massive team will for it to happen. Utter depression when we woke to rain on Sunday. It might not be the end of the story though… more later. Hopefully Cubby and I can get a couple of hours in Hell’s Lum preparing a bit more for Saturday before the heavens open again. It’s all a bit nerve wracking really seeing as the Atlantic just keeps thrashing Scotland with rainstorms back to back every day. 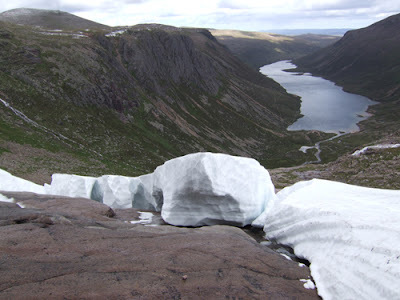 The freezing level is dropping near to the summits too, so maybe even a bit of white stuff is in prospect? Here’s hoping for some god fortune by Friday at least. If it’s wet Friday then the harder line is out of the question for The Great Climb – the drainage lines on it need a full day to dry. If anyone wants to get in touch during the week, I’ll sometimes have mobile reception, sometimes not. Leave me a message. I’ll hopefully get onto the net at Glenmore in the evenings and I’ll post up some words and pics of what we get up to over there during the prep climbing days. The Great Climb – I might try and climb something a bit harder??! 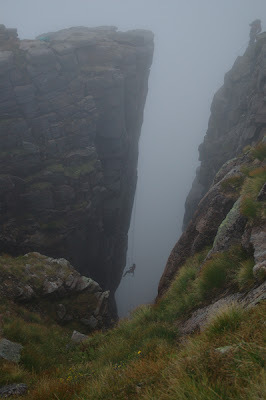 After I’d wiped the sweat from my brow from the slog over Cairngorm to Hell’s Lum I abbed into the depths of the Lum for the second time for another 8 hour shift of cleaning and prospecting new routes. On my first day I looked across at a beautiful smooth marbly wall which looked utterly inspiring. I abseiled down it quickly and found a perfect line of miniscule brick edges running up it, but very (extremely) little protection available. “E11” popped into my head. But yesterday I got stuck into it and found that I could actually pull on those holds. That was quite a surprise, and after a while I linked it in one go at hard 8a+. Thing is, falling from the hard part or the sustained moves above would mean certain death, no question. So where Indian Face is 7b with bad pro, this is top end 8a+ with even worse pro. Hmmm E10 for sure. It’s probably the best quality rock on a new route I’ve ever tried, so the motivation to climb it is so strong. What better day could you choose than when such a momentous event as the great climb will capture such a great route on film? Well yes, but it’s not as simple as that. At E8, even E9, I could wait until the filming team were ready and wear a radio mic etc so they get the grunting they want. But E10 is very very close to my limit, and the consequences of blowing it as high as they could get. So to climb this next Saturday, the temperature and humidity must be right, the build up must be right, the social vibe must be right, the resting times must be right. If anything upsets the necessary rhythm of preparation, I will have to make a cold decision to pass up the opportunity to complete this amazing project and go back to my plan for the E8/9 just to the right. Exciting! BBC 2 Scotland between 1 p.m. and 7 p.m.
BBC 2 Network between 5.25 p.m. and 6.35 p.m. The BBC High Definition Channel between 5.25 p.m. and 6.35 p.m. 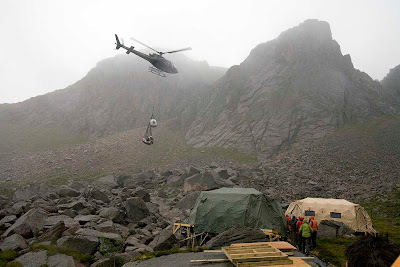 The Web – all day, streamed live from The Great Climb site. In typical Scottish style, a deep autumnal low with flooding and gales are forecast for Tuesday and Wednesday. Well, the Scottish weather gods were never going to make it easy for us were they? The line I tried yesterday with some notes on it describing the full horror… I sooooo hope the conditions are right for it next Sat. Do a sun (plus fresh breeze) dance for me. 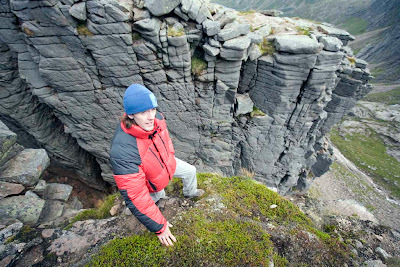 Some time ago the BBC asked me if I’d be keen to climb something hard on Cairngorm for a live outside broadcast this summer. I couldn’t quite believe it. 40 years ago the BBC did a live OB over three days with Bonington, Patey, Haston and others climbing the Old Man of Hoy. It happened again a generation later in 85 in Glen Coe, and now once again in 2007. Broadcasting is very different now, so it was quite a surprise to hear that climbing was going to be on primetime Saturday television for 7 hours in a single day! 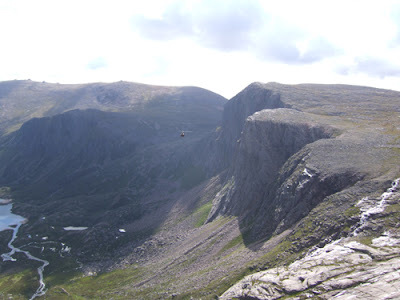 The venue is going to be the Loch A’an basin and its impressive cliffs; Shelterstone Crag and Hell’s Lum. This is somewhere I’ve climbed rarely, being a west coaster. So it’s cool to be exploring somewhere new so close to home. 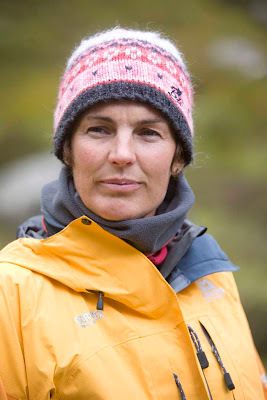 My brief is simple – to climb something very hard, and preferably a new route. I’m more into steep climbing so I opted for Hell’s Lum and went for a look at it. I knew there were new lines to climb in there, but I’d never seen them up close. Wow. The lower part of the wall is quite amazing. Perfect granite with four pristine straight up new lines to do, and that is just the first pitch. 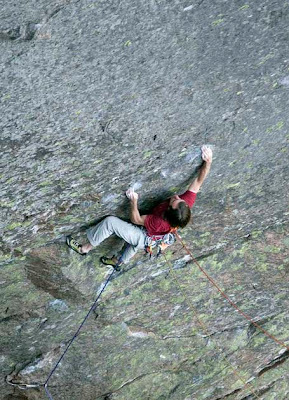 If the conditions are good on the day, I’m going to try to climb a beautiful smooth wall, about E8 or E9. The protection is poor so falling off hopefully won’t be in the screenplay. If I do you’ll see me getting carried off in the helicopter to hospital. Amusingly, the hardest move is a wild dyno as well. Most TV friendly for the viewers, most terrifying for the climber. Pitch 2 looks like an E7, a bold traverse across a smooth wall, only protected at the start. So the further across you go, the bigger the pendulum you face if you fall. We’ll go for the flash and see how we get on. Perhaps I’ll allow three falls before I succumb to a plan B. I’m not sure what plan B would be right now? The final pitch isn’t quite so physically demanding, even though it’s the steepest. The holds are quite big, but they are also detachable! This means the chances of protection holding a fall are… erm… somewhat reduced. E6 6a/b and sudden death if I fall. I might not be smiling on this pitch too much. At least the topout is quite stunning if we succeed. 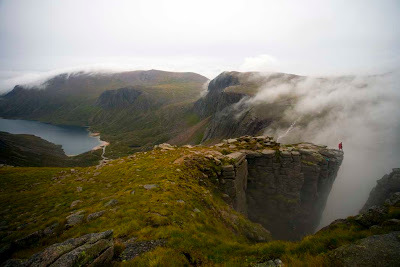 Hell’s Lum Crag, Cairngorm. Coming to a screen near you! When is it on? Saturday 18th of August 1pm-7pm (yes you did read that correctly!) BBC2 Scotland or streamed live on the BBC site. 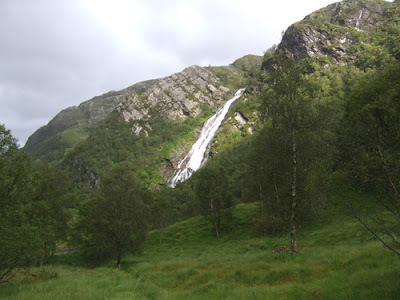 I’ve added more photos of Ring of Steall to the Gallery section and added frequently asked questions about my email training programs and coaching sessions. If you have any more questions about these, please drop me an email. Michael arrived for some more days of intense climbing. Sport climbing again since the country continued to be awash with rain. We were even washed out of normally perma-dry Steall by the condensation dampness from a sudden rise in temperature (the southerlies finally made as far north as Lochaber!). The warmth lasted barely 12 hours though. 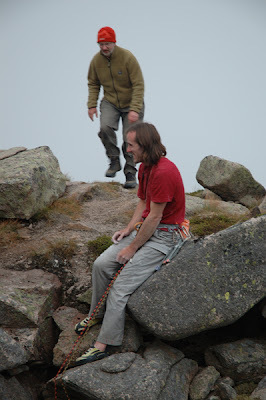 Next morning, with a good forecast, we headed into Cairngorm to clean new routes. Autumnal in the glens, baltic on the high plateaus. 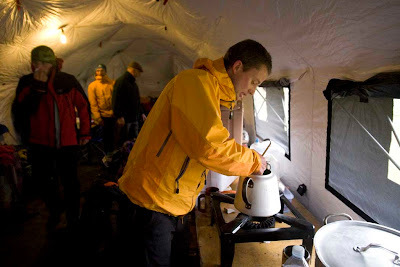 I forgot my thermals, so much shivering later, I had partially cleaned a new climb for the Great Climb programme and was ready to retreat to Aviemore for a cup of tea. 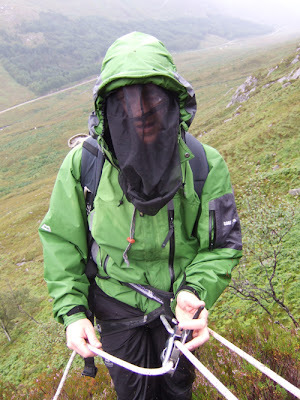 Next day we witnessed one of the great wonders of the natural world – what we both agreed was the densest swarm of midges either of us has ever seen. We were scoping out a new crag. 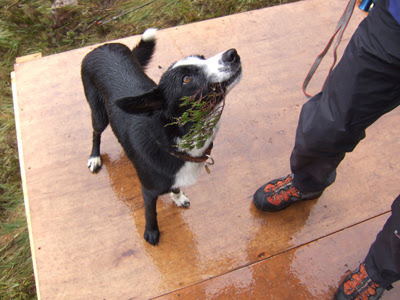 We should have known better; warm, pouring with rain, still, and knee deep heather and bog approach. We ran for our lives. The final day was looking similar as we negotiated the Loch Lomond road in a heady mix of floods, torrential rain, collapsing road and big coaches full of tourists. Two cakes each in Lochgoilhead caf was enough to raise the psyche level to walk into the Anvil. 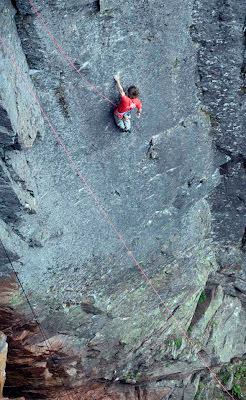 What an amazing crag it is – bone dry, while all around it the UK drowns in summer floods. We got cracking. 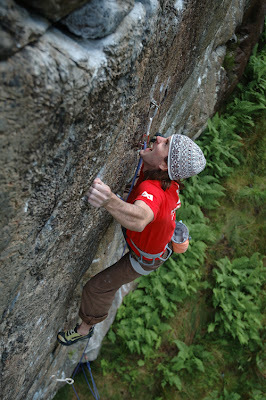 Alan Cassidy’s new route Bloodfire 8a+ was first to go down for the warmup, first redpoint. Next up was Dave Redpath’s route Fire Power. I’d belayed Dave countless times over the three years he was trying this, so I’d steadily built up a huge curiosity as to just how crap those slopey pinches o the crux were. Fortunately, I had vicarious engrams for the crux after watching Dave perfect them a thousand times, so progress was quick. After a couple of near misses I was clipping the belay just as some weak sunshine glistened on the loch and broke the deadlock of bitter winds and intense drizzle. 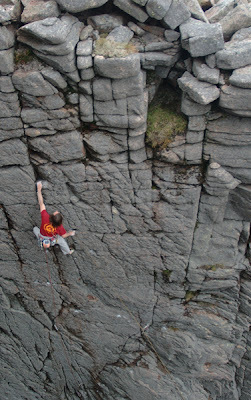 Scottish climbing is amazing when you go to the right place at the right time. The Anvil psyche is on again for autumn. 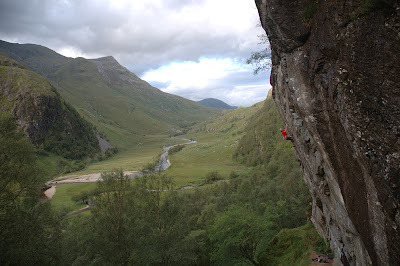 Ring of Steall, 8c+, Steall Crag, Glen Nevis. Photos by Claire MacLeod. Click on the pics for a bigger view. Yesterday I climbed the Ring of Steall project at Steall hut crag. When I got to the belay I had to slap myself and confirm with Claire that it had actually just happened and I wasn’t dreaming. In fact, a dream like state was exactly how I climbed it. The whole thing flowed with effortless ease and perfectly focused effort, on the very first time I made a proper redpoint attempt. Ascents that happen so perfectly with no mistakes, no hesitation and no consciousness of self are so rare. Nevermind on a route I’ve been trying for ten years! I’d say that was by far the most focused moment of my life so far. It was so unexpected, but maybe it had to be to occur in the first place? This project has been an inspiration simmering in the back of my head for ten years. 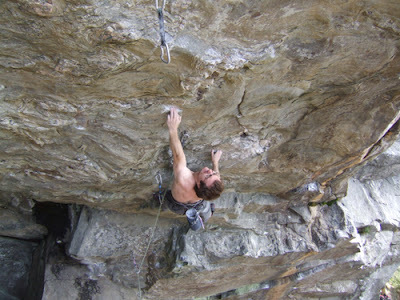 It was equipped and tried by Cubby in the early nineties and he worked hard on it, coming very close to getting past the crux section before injury and work got in the way and the momentum was lost. I’ve talked with Dave about the project many times since and it was always a huge goal for either of us. If Dave had done it in ’92, it would have been one of the top five sport routes in the world at the time – an incredible effort. 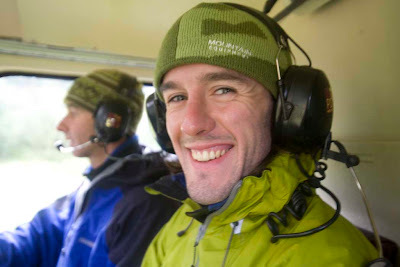 Dave was (still is) a massive inspiration to my climbing, and climbing his hardest routes was a huge goal of mine, in my progression in climbing. 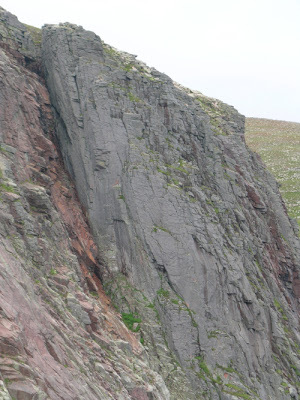 Although I managed to climb most of them, the Steall project always remained as a huge test I wanted to pass, but that crux just felt brick hard. Every year I had a day on it, and every year it seemed above my level. 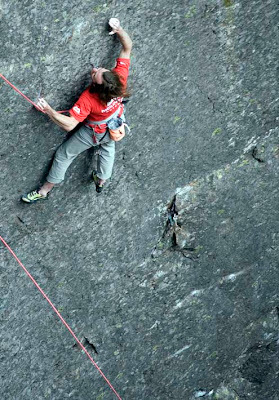 It’s about 8a+ to get to the big undercut in the centre of the wall, then you have to get an evil sloping crimp with your left hand, that is so smooth, it’s almost like its been buffed and polished – nothing but pure strength will do to hold it. Then, it’s the Egyptian. Over the past month I’ve walked down the path from Steall feeling that it’s the most beautiful move I’ve ever experienced on rock, and other nights been cursing it to hell. Last week I finally mastered the correct timing of how to drop the knee and then push in the exactly correct direction with each foot. It’s the ultimate move – when performed with technical excellence, it's easy. But if you don’t move the limbs in the correct sequence of subtle shifts, no amount of strength or psyche will make any impression. This type of climbing suits Cubby’s technical mastery perfectly, so it’s a shame that he wasn’t able to finish it. It’s no surprise to me that the route left such a big impression on him as it has done on me – perfect movement in a beautiful place. Having completed this route, if I had to give up climbing tomorrow due to some disaster, I’d be satisfied with my effort. It’s the first time I’ve ever felt that. Climbing it has confirmed in my mind something I felt for the first time after climbing Rhapsody; We can really do anything, and I mean anything we want. Circumstances are indeed barriers, but never impenetrable ones. We are limited only by knowing exactly what we want and having the pure motivation to find it. I always heard this idea from ‘motivational types’ in the past. As a sceptic I’ve spent over ten years trying to refute it by repeatedly trying seemingly impossible projects. Every time the result is the same – Tasks you are not truly motivated for may always remain beyond your reach, tasks you are deeply motivated for take you on a long and convoluted route around the barriers that circumstances create. Sometimes, in the thick of the maze of circumstances, you realise your motivation is not deep enough and its best to try something else. But when the motivation remains through deep frustration, the results are always… always… just around the corner.